The Fifth/Third Bank is hosting a contest to name our young Peregrine chicks. If you are an area educator or involved with students who are watching www.KalamazooFalcons.com you are especially invited to submit a name for the contest. Name submissions from a school should be made through the Contact Me section of the website. 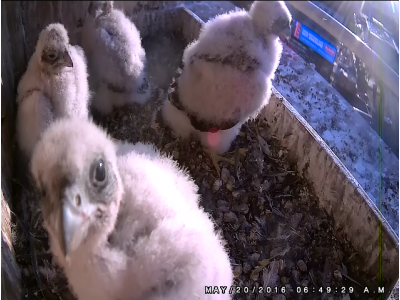 Just send the name, reason the name was chosen, your school, and how you use the falcon cam in your classroom. All other submissions can be made at any area Fifth/third Banking location starting May 27. The contest will end on June 7, so be sure to get your submissions in soon. There are two male and two female chicks this year and names with a tie to Kalamazoo or gender neutral names are always well received.